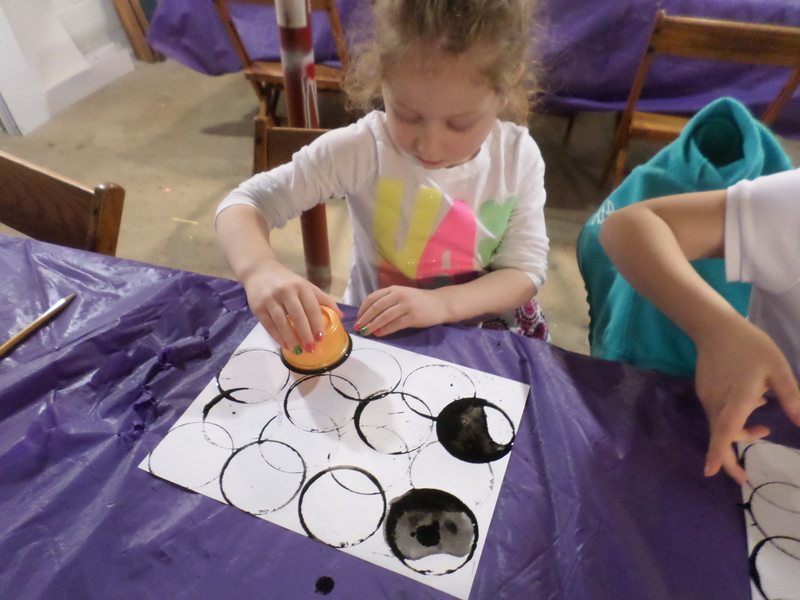 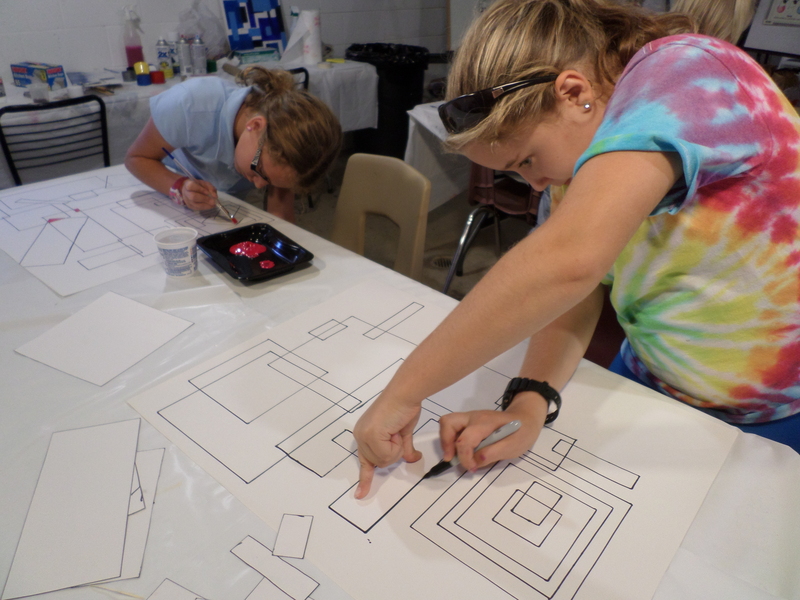 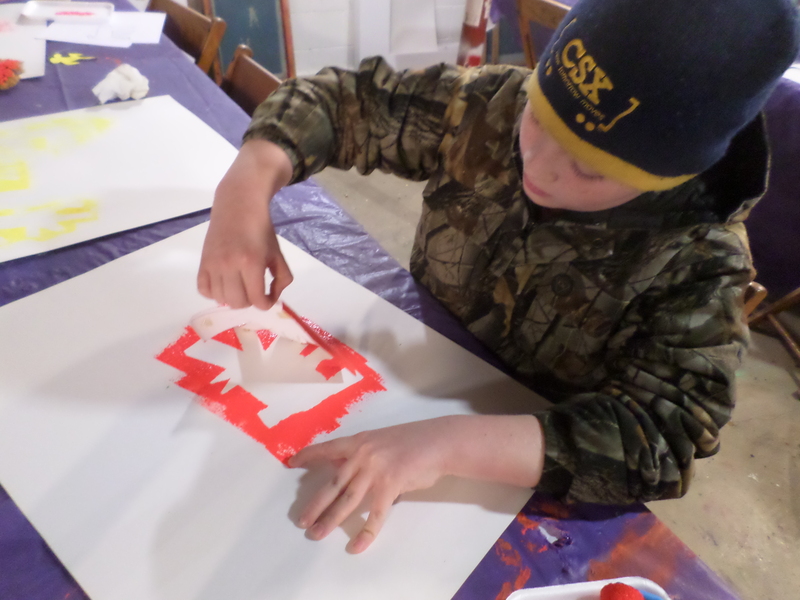 For our final Wednesday Afternoon Art class students explored printmaking. 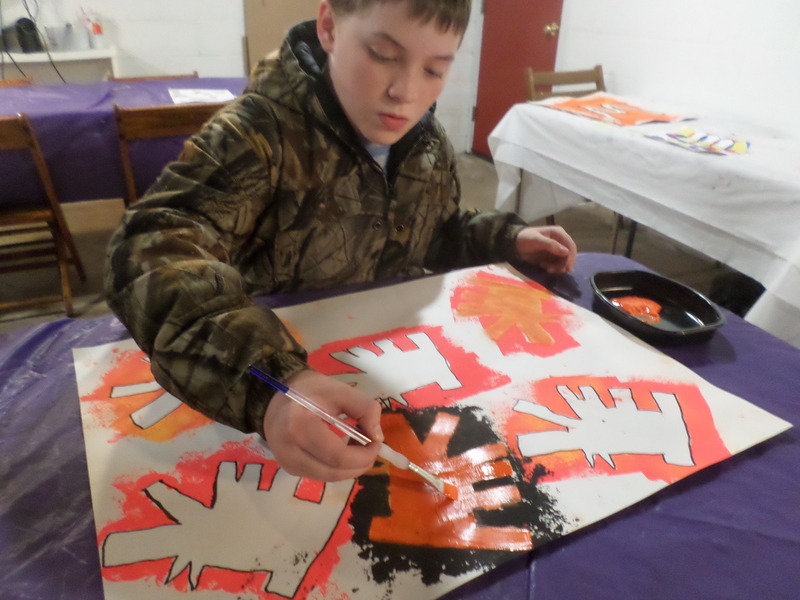 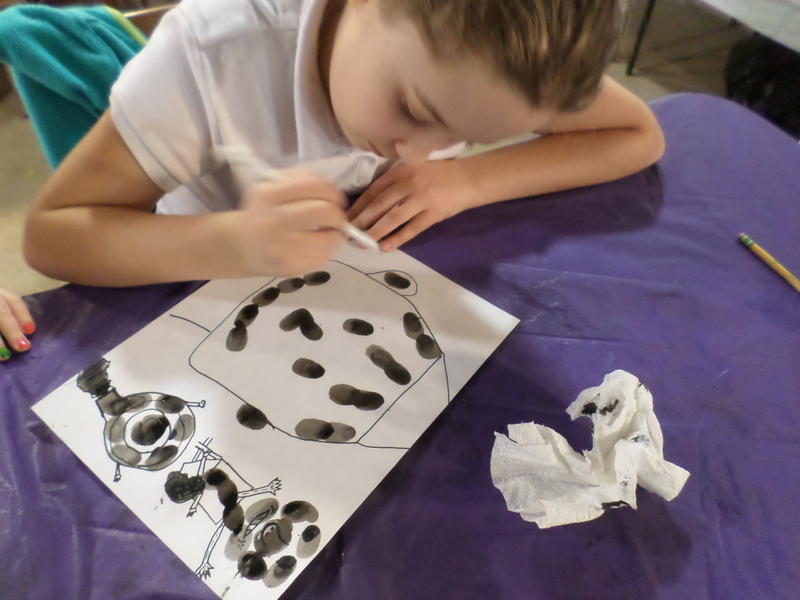 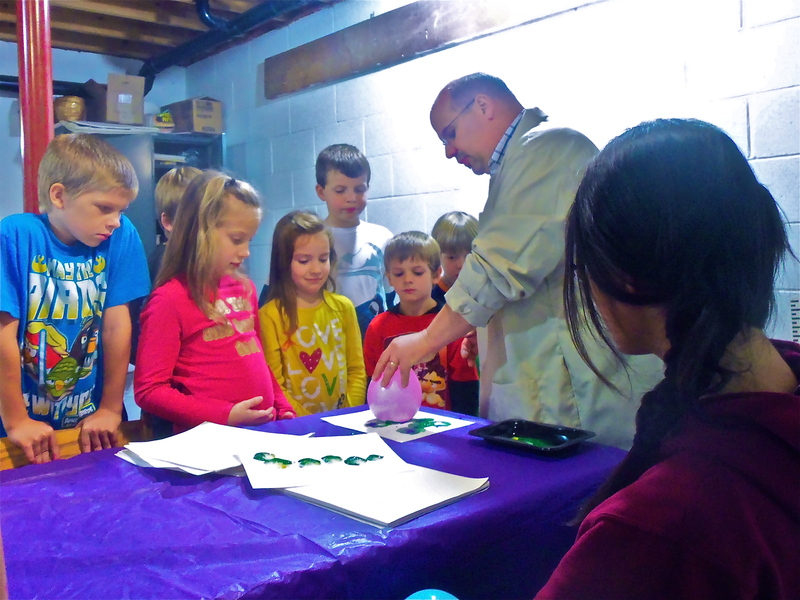 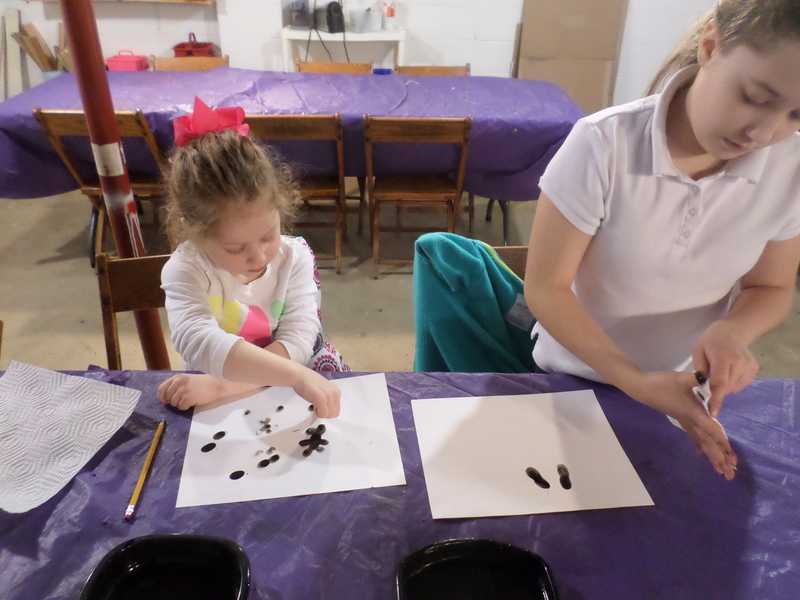 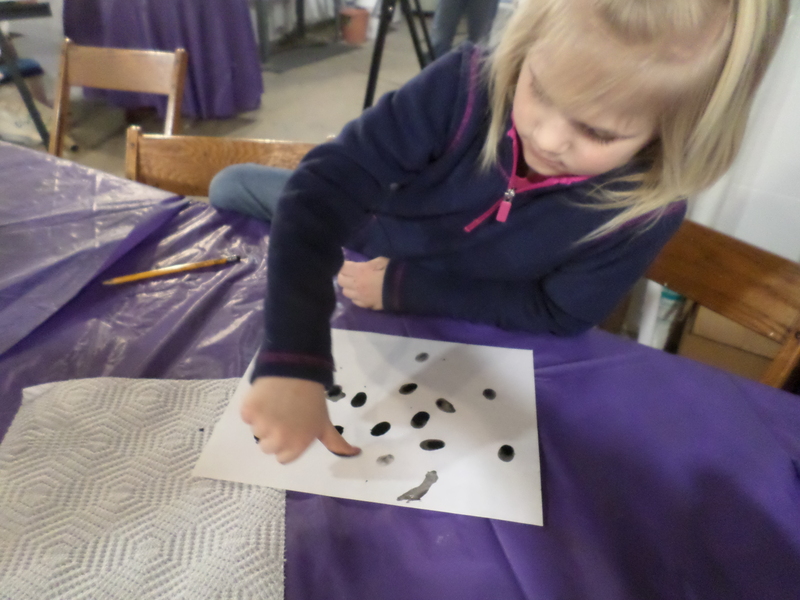 Students learned to create mono prints using rubber molds of leaves. 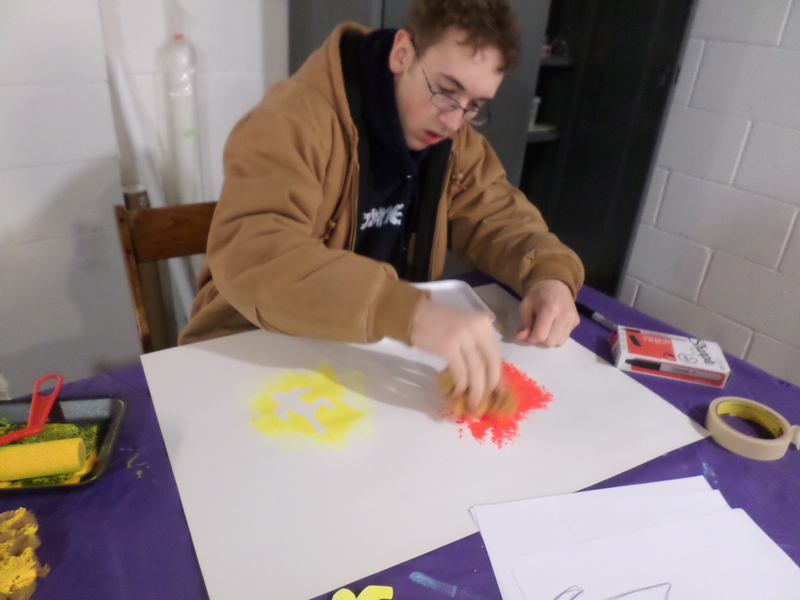 Everyone used various colors of tempera paint on the molds. 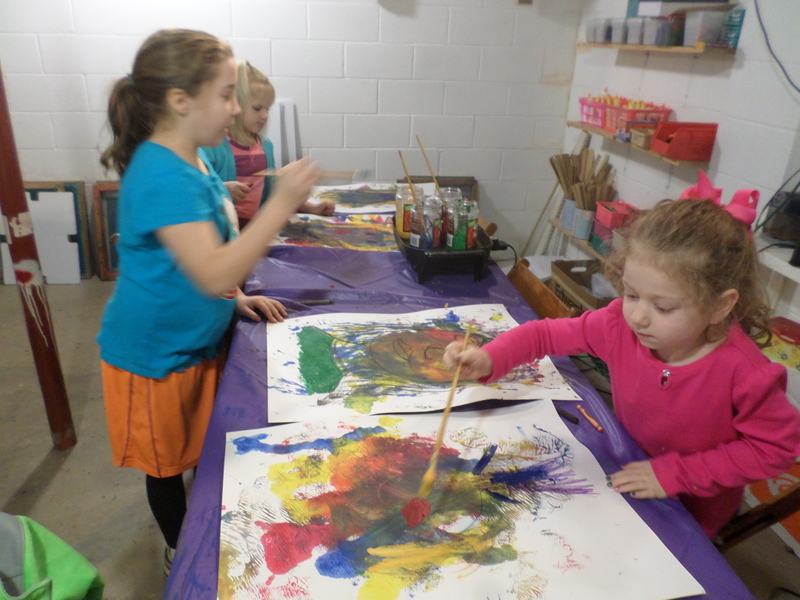 The students enjoyed learning the process and creating layers of leaves. 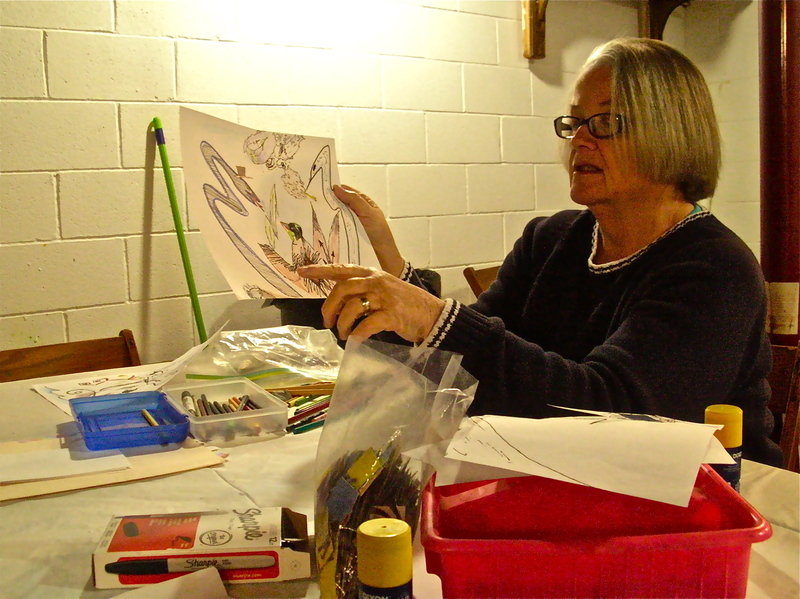 The creative process engaged all of the participants in the class. 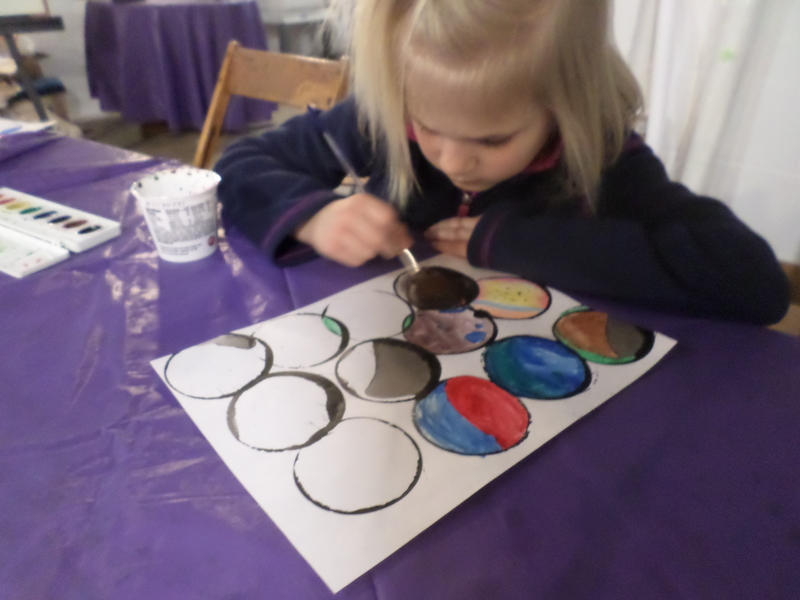 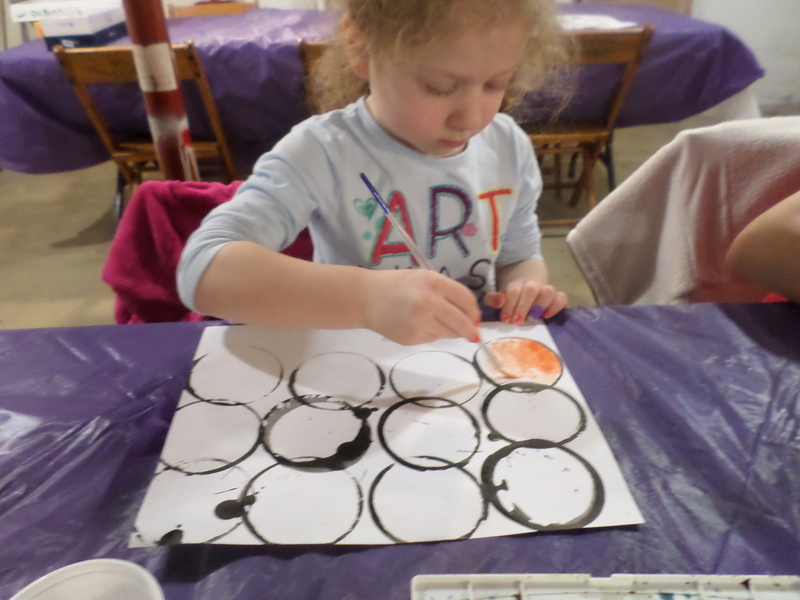 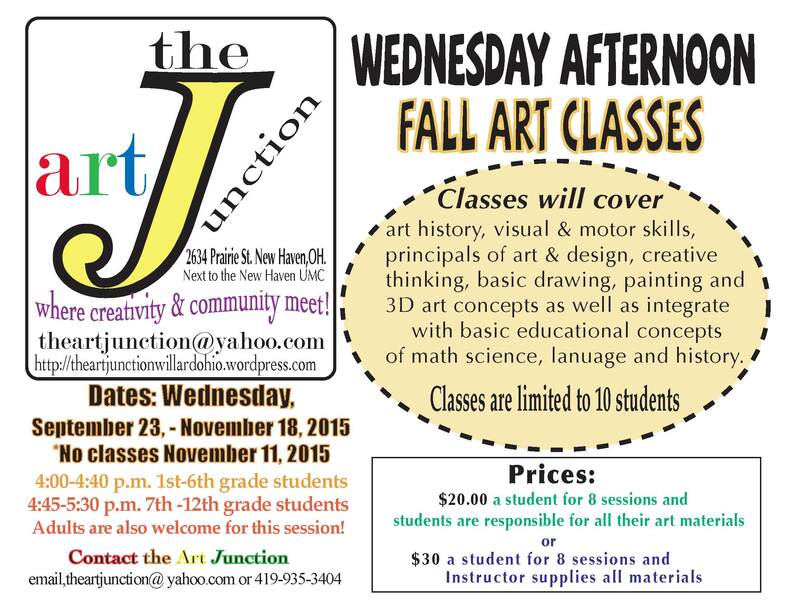 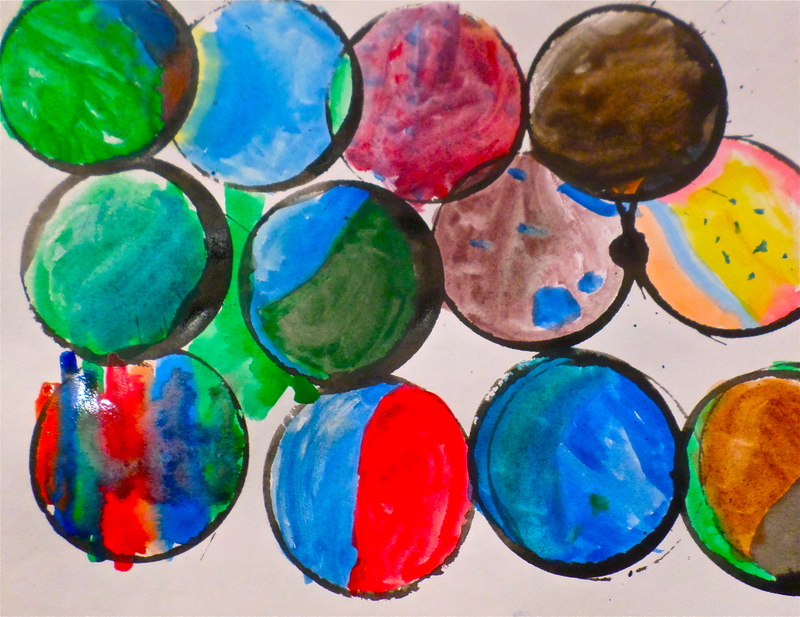 When our classes resume in 2016 we will be moving to Tuesday Afternoon Art classes. 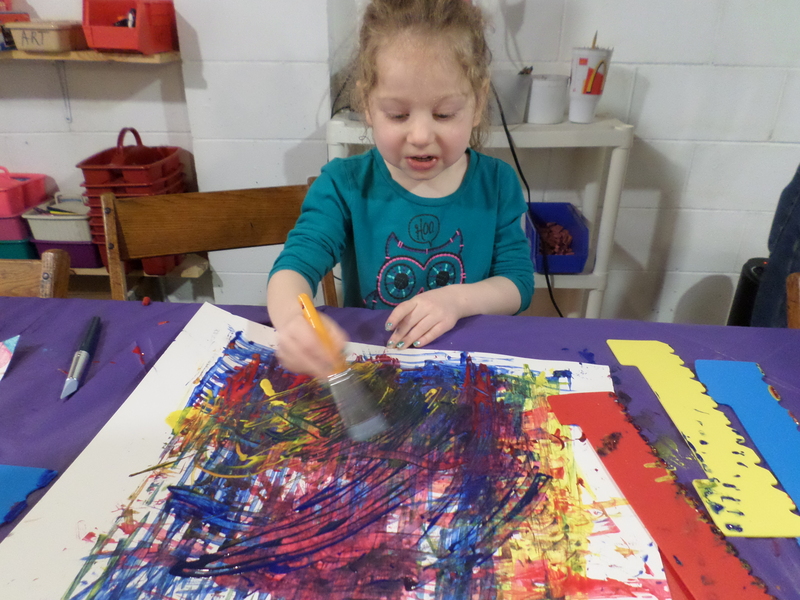 Hopefully you can join in the fun! 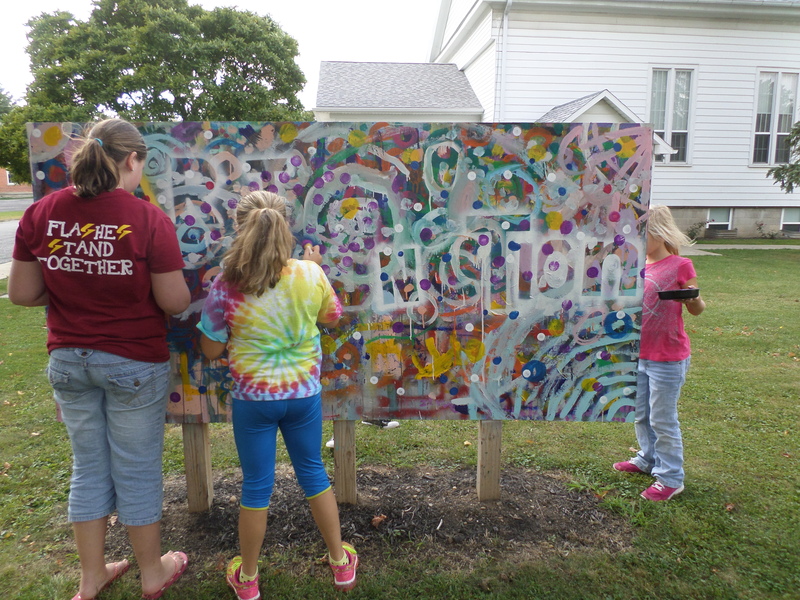 Wednesday afternoon art students worked on our outdoor mural. 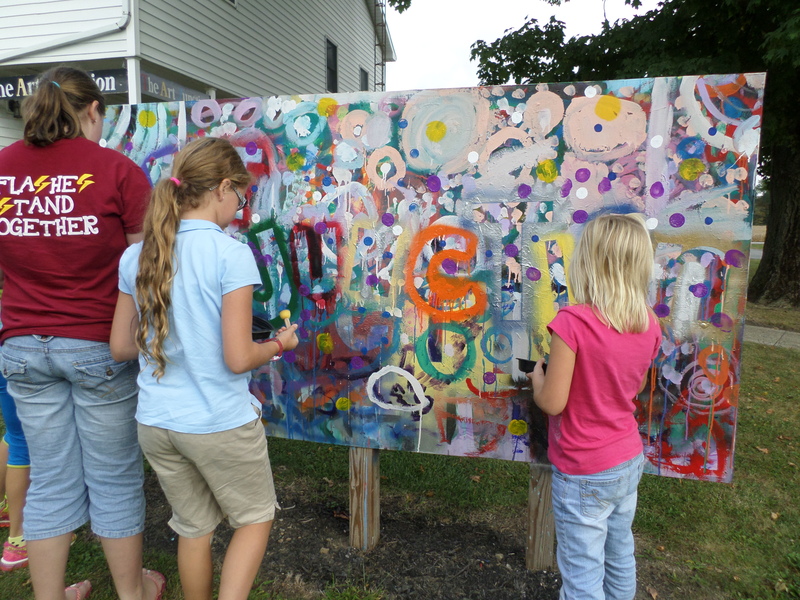 Everyone enjoyed adding to the ongoing mural in front of the Art Junction. 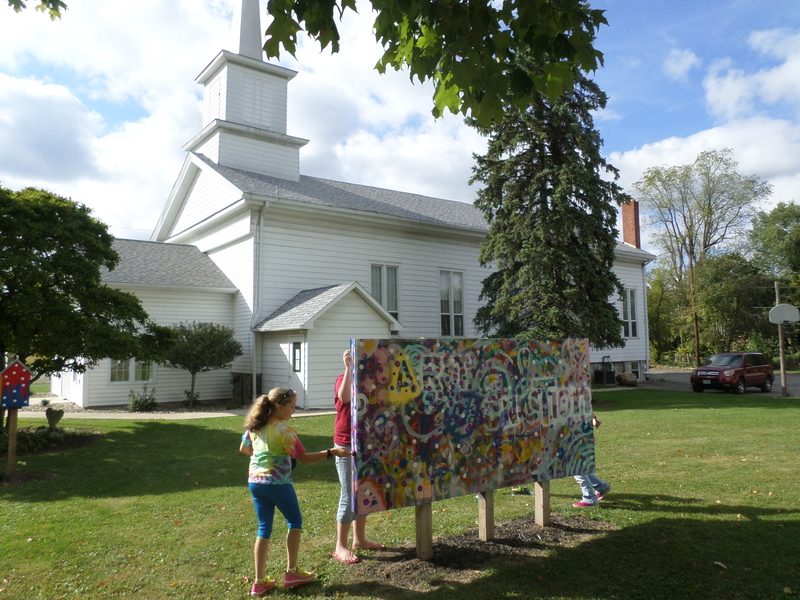 It’s fun to see the various changes that take place in our little outdoor mural. 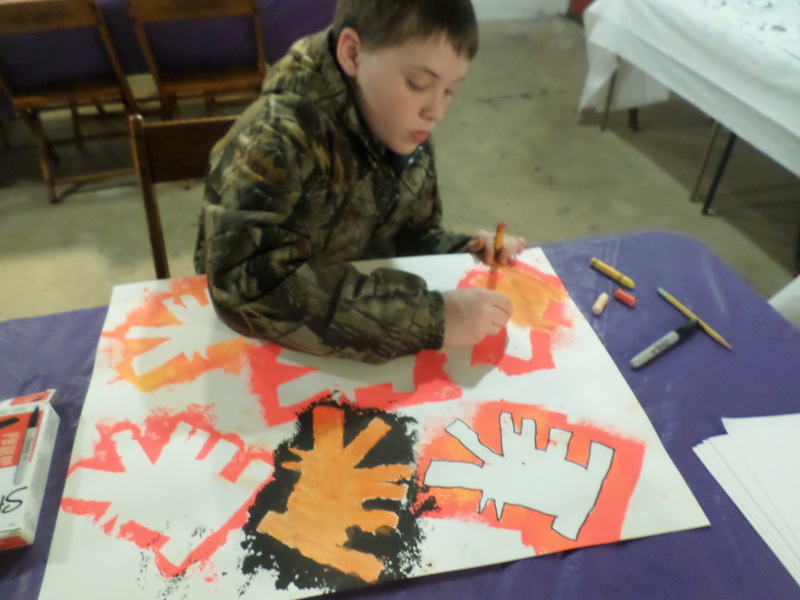 The students really enjoy having the freedom to express themselves in an outdoor setting that is visible to the public. 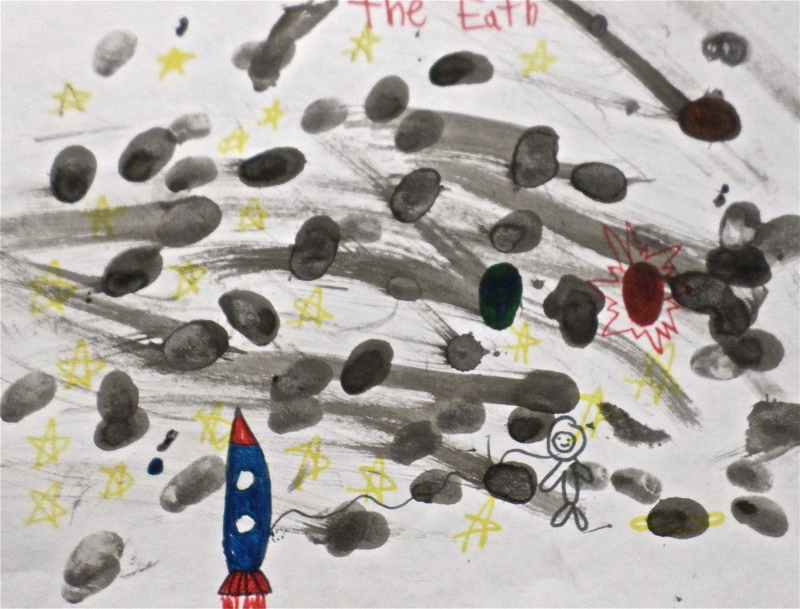 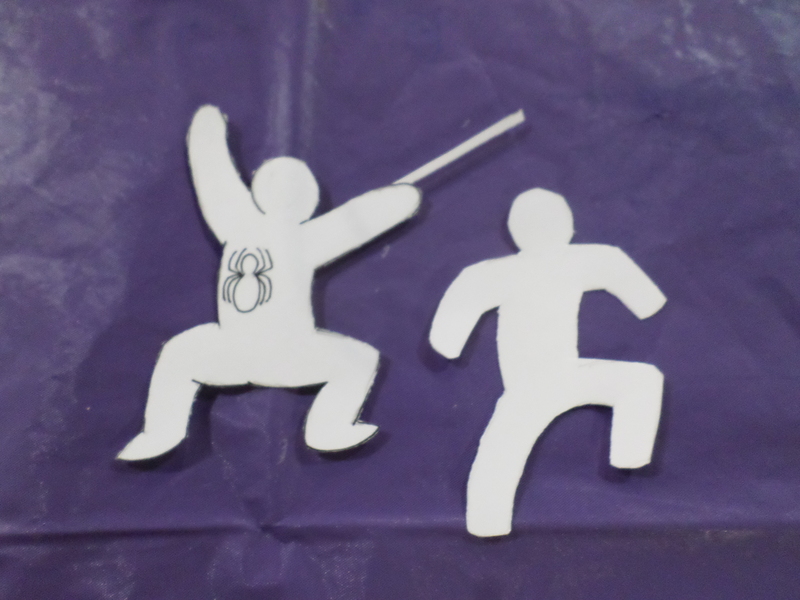 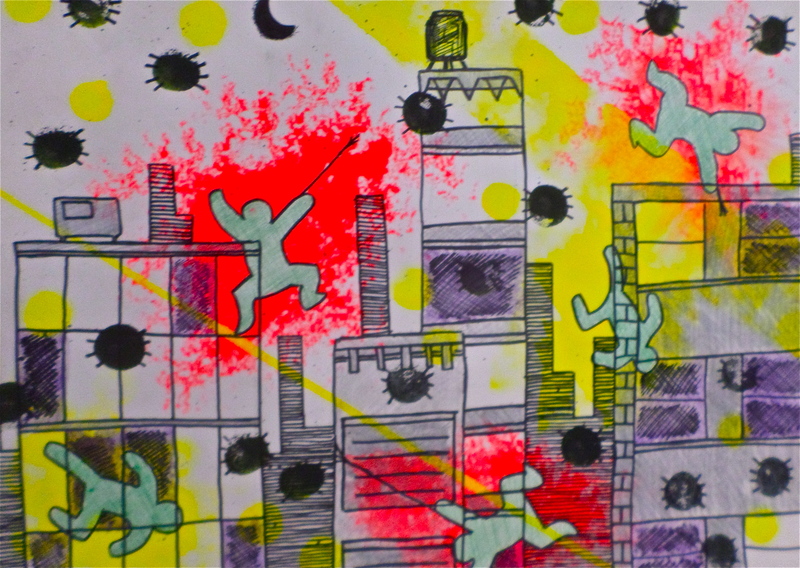 Here is a detail of the students’ work. 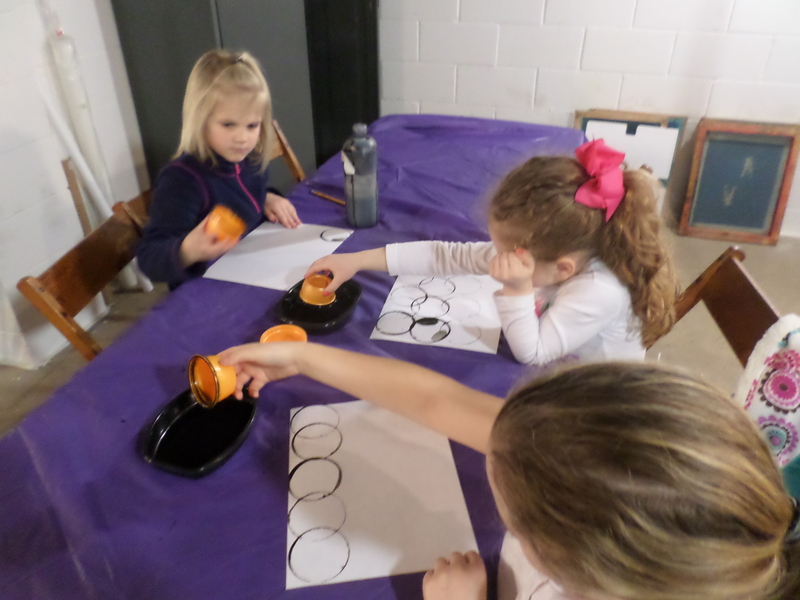 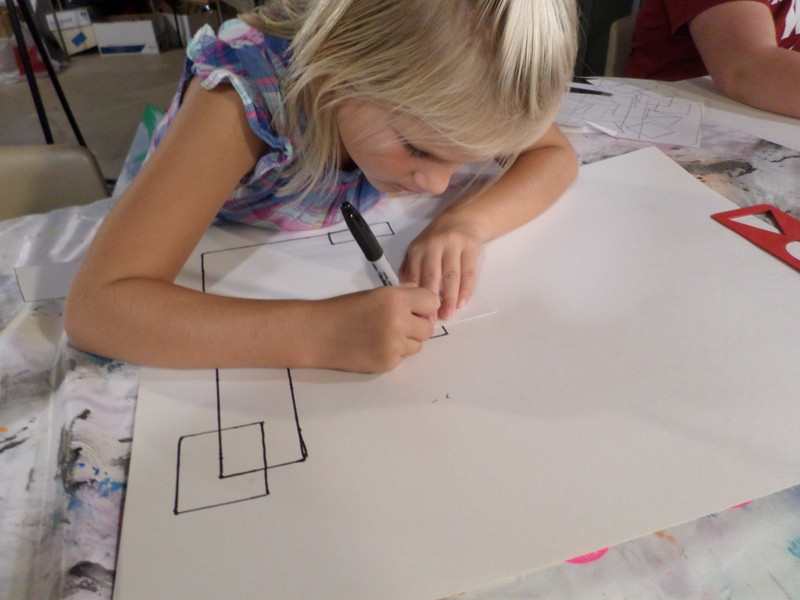 Wednesday afternoon art classes have begun exploring repeated shapes. 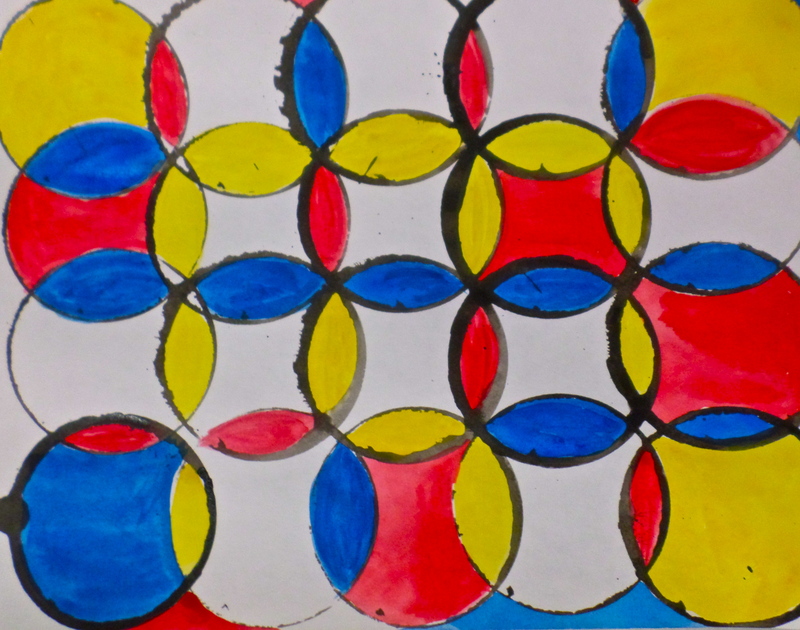 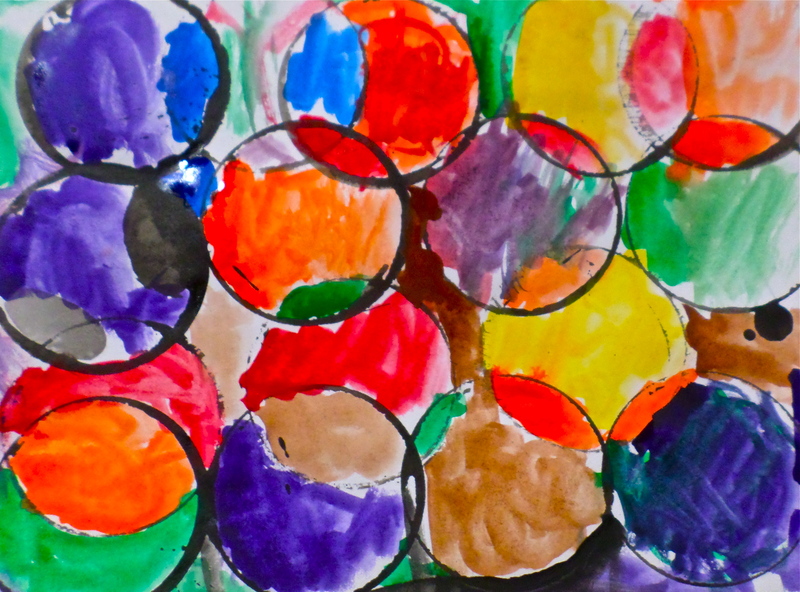 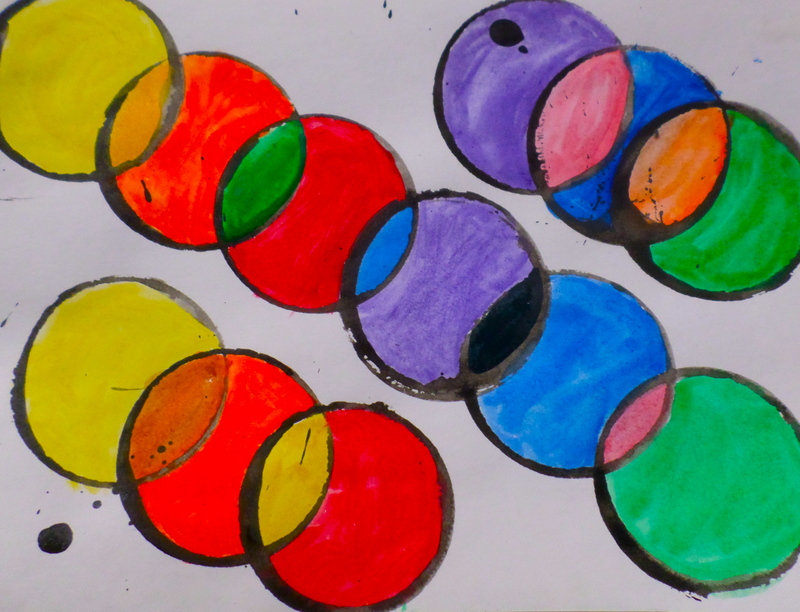 Students created a pattern of shapes much like the artist Piet Mondrian. 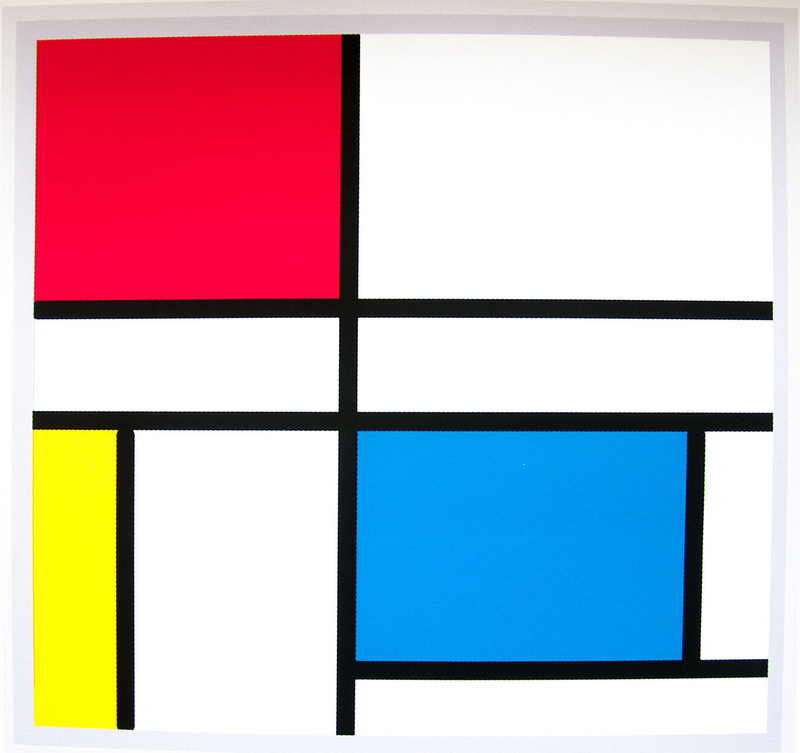 Piet Mondrian’s Composition with yellow, blue and red 1927. 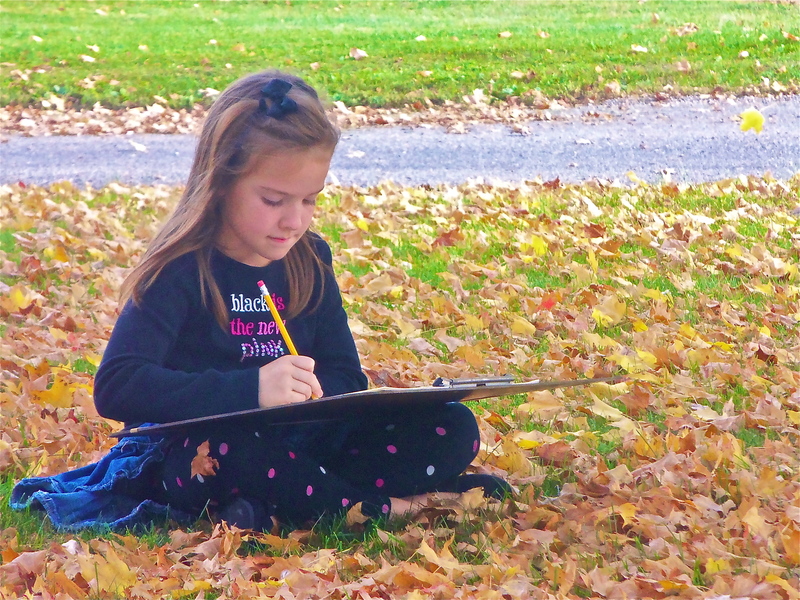 Everyone is in the process of adding color to their images as they take them in unique directions. 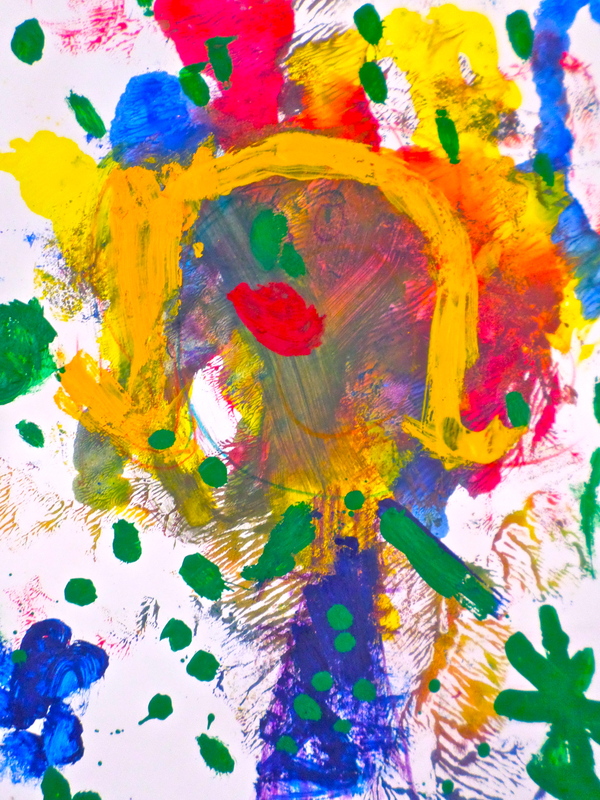 I look forward to see the students’ creative journey. 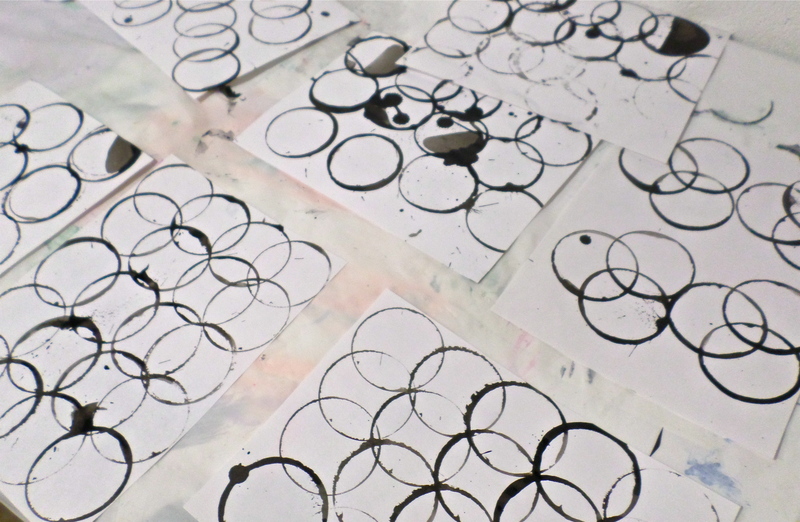 Wednesday afternoon art students have been exploring printmaking. 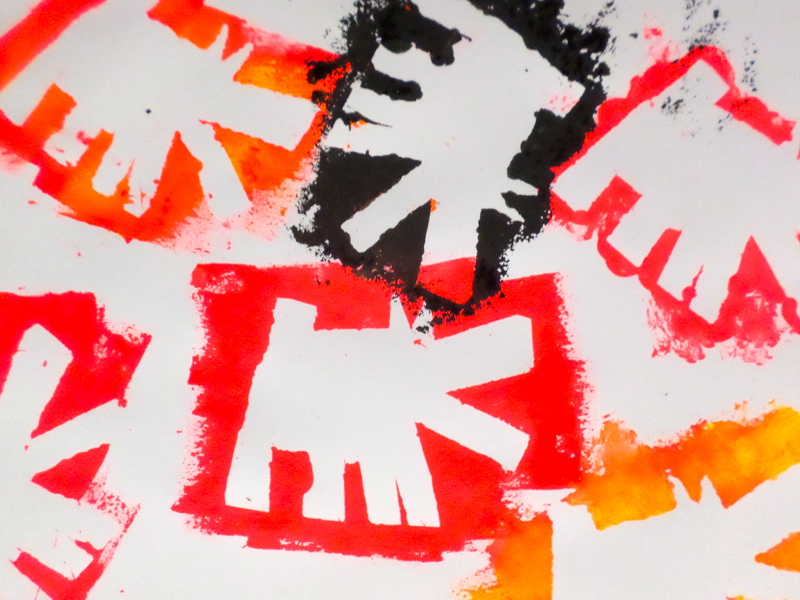 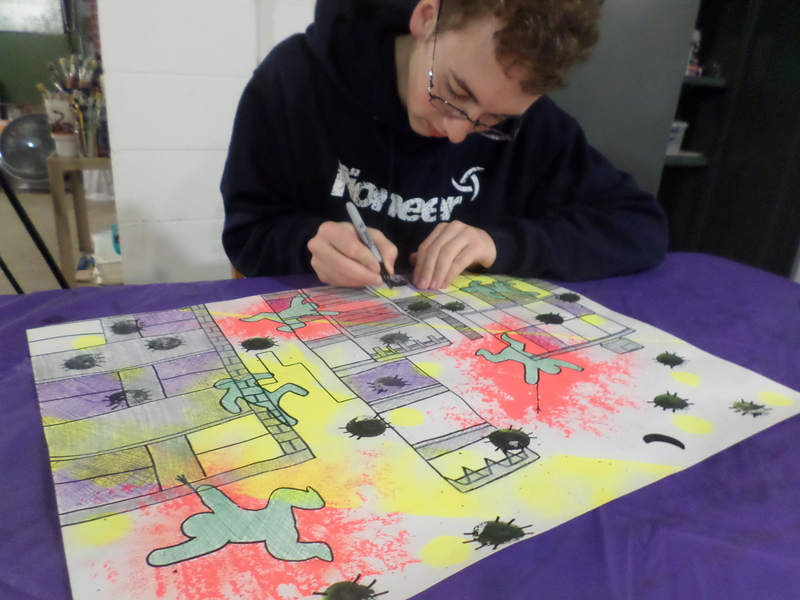 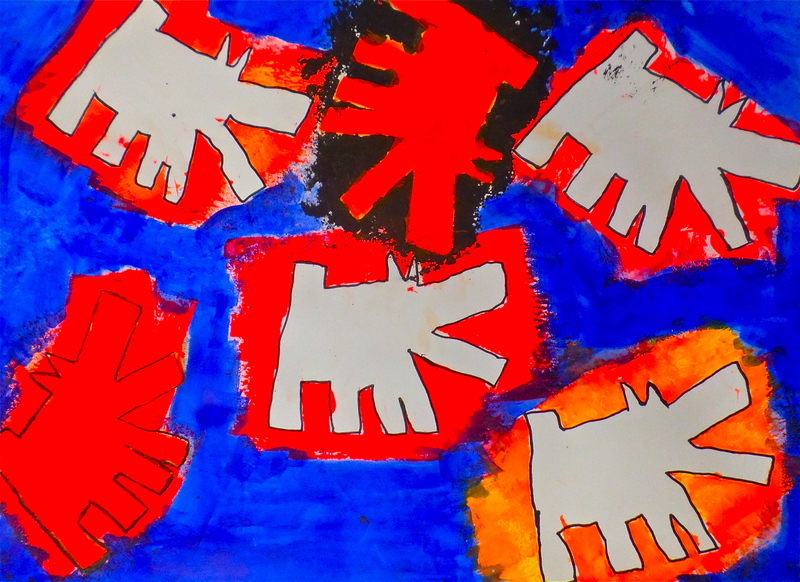 Students were using their Keith Haring-like shapes to create their prints. 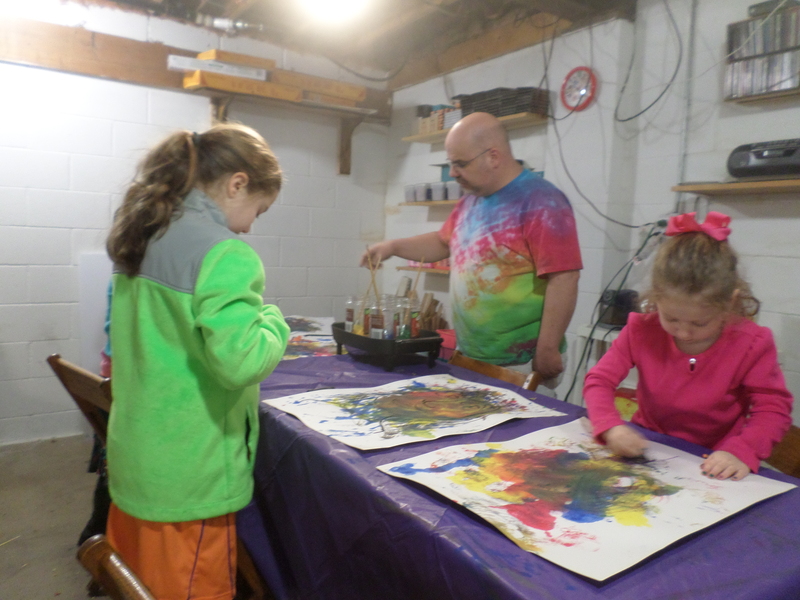 It was a fun yet challenging experience for everyone. 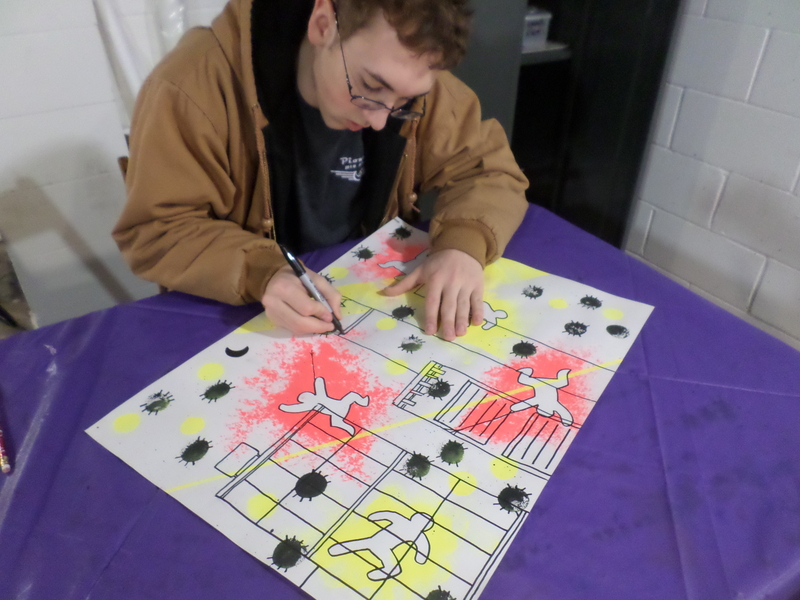 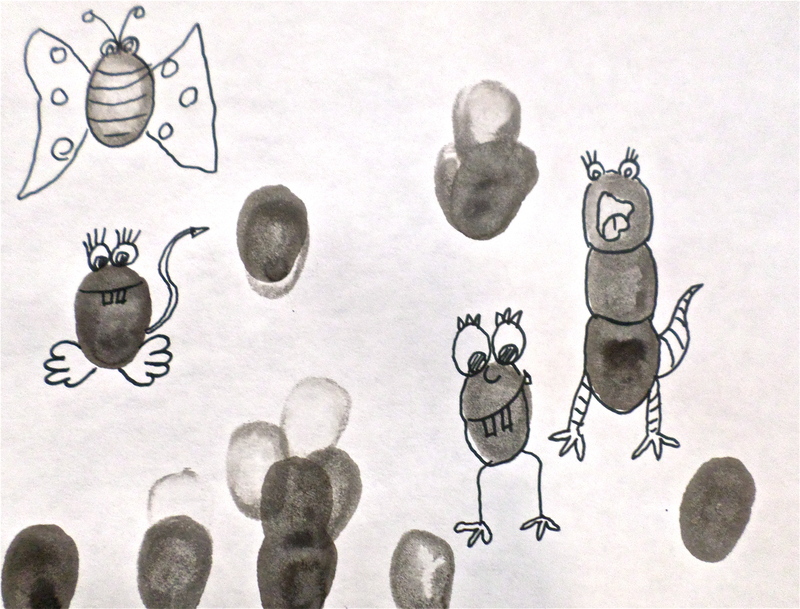 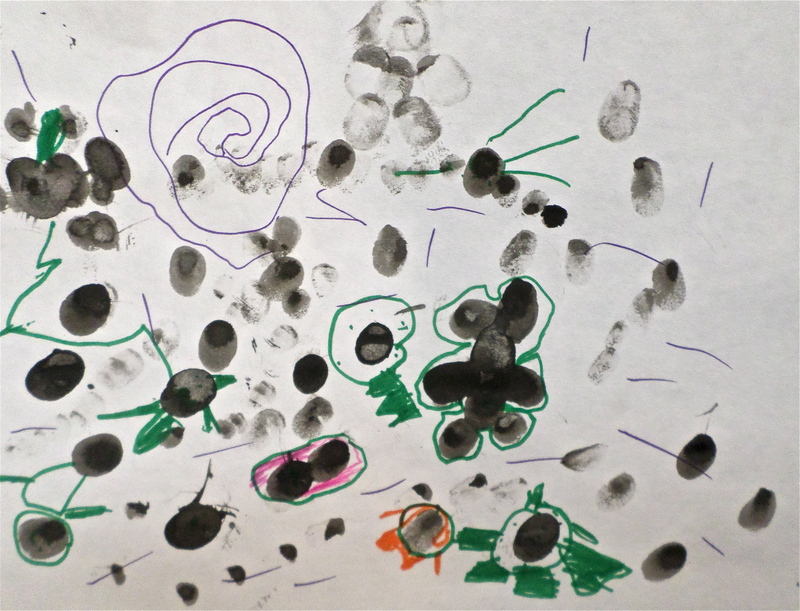 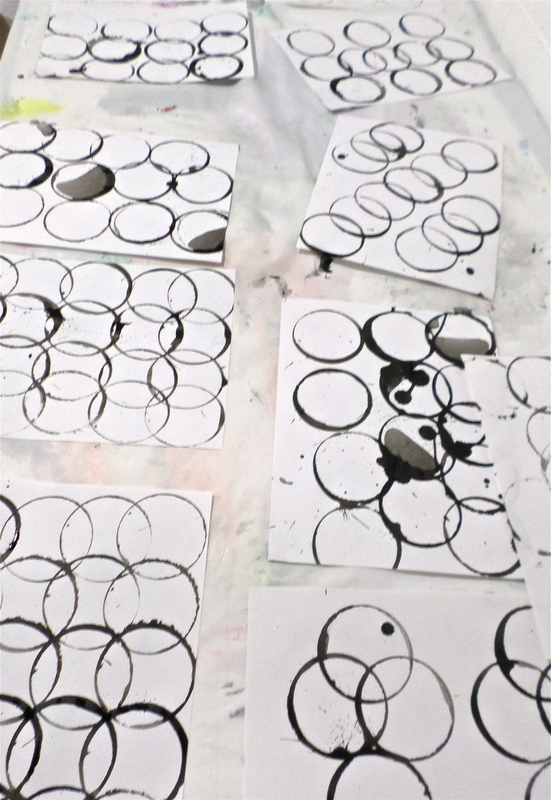 The mono-prints will be used to create a bigger image from the beginning prints made at this session. 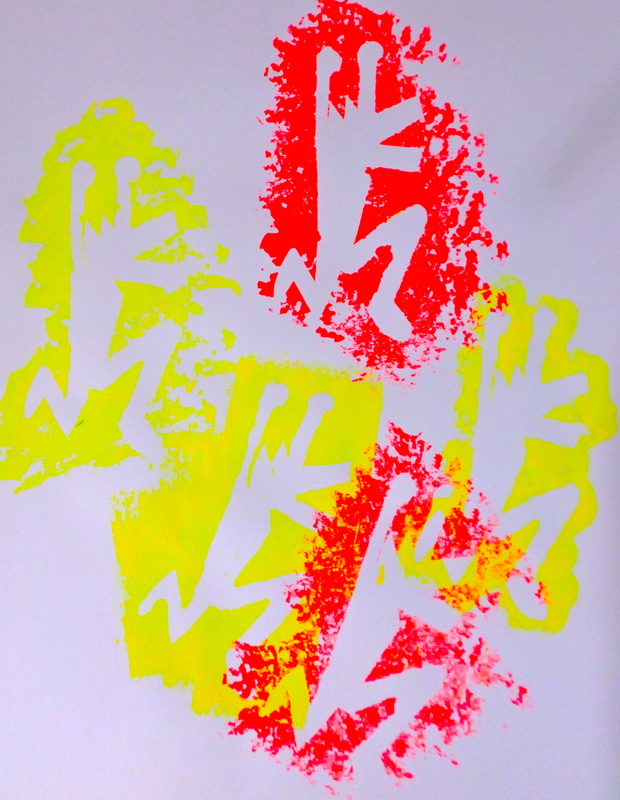 It will be fun to see what the prints emerge into as the process continues. 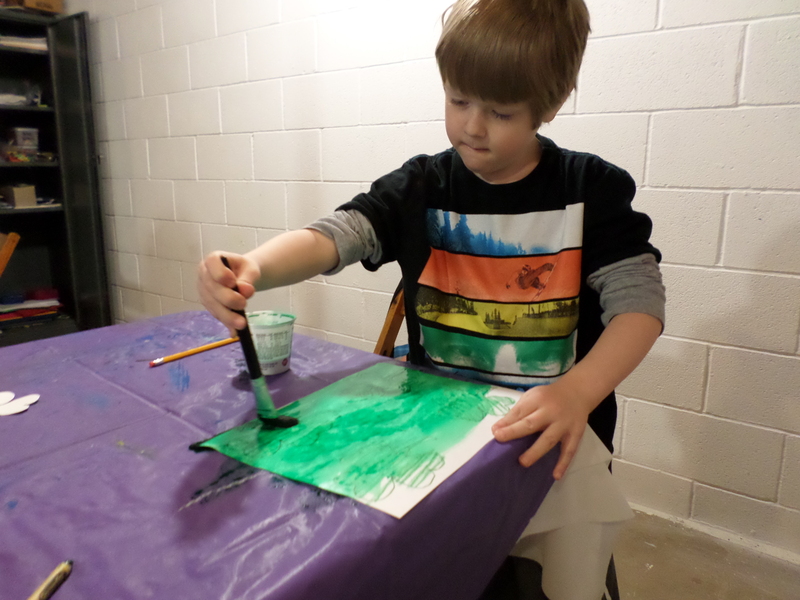 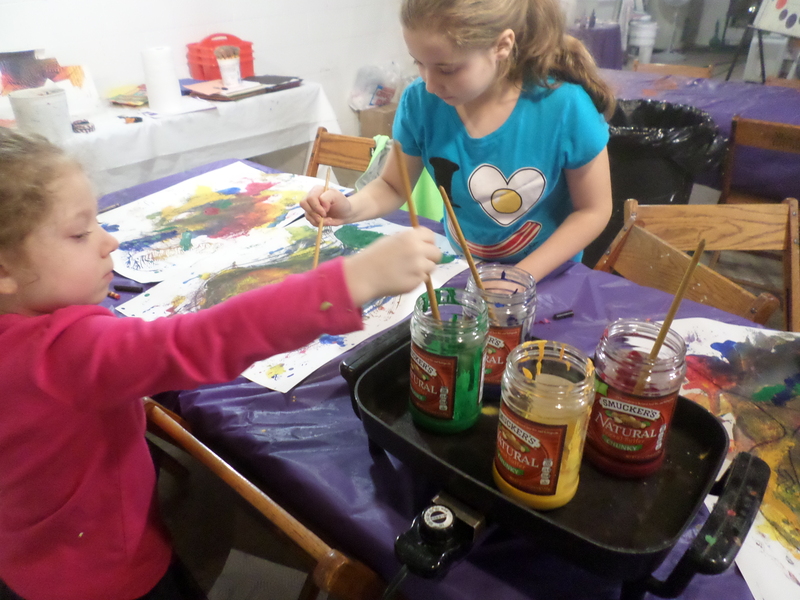 Wednesday afternoon students explored painting with melted crayon recently. 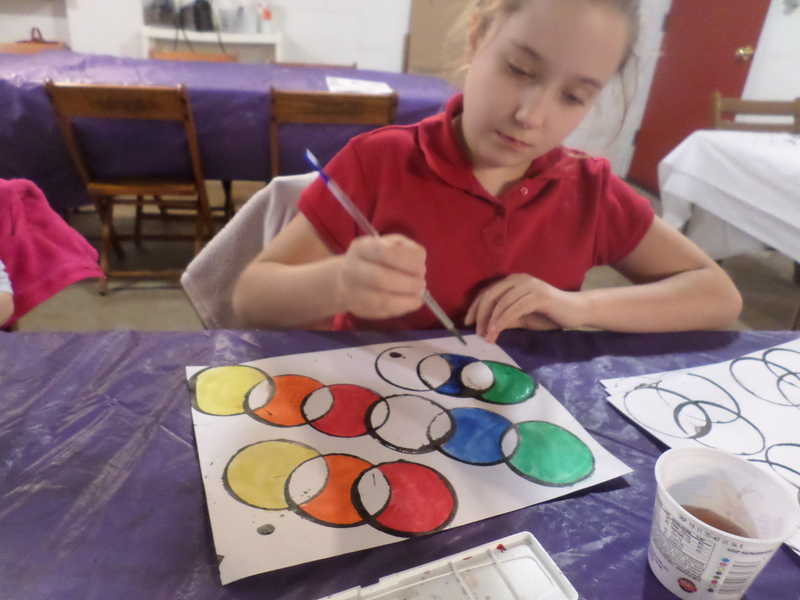 Students began with one of their paintings from last session as a background. 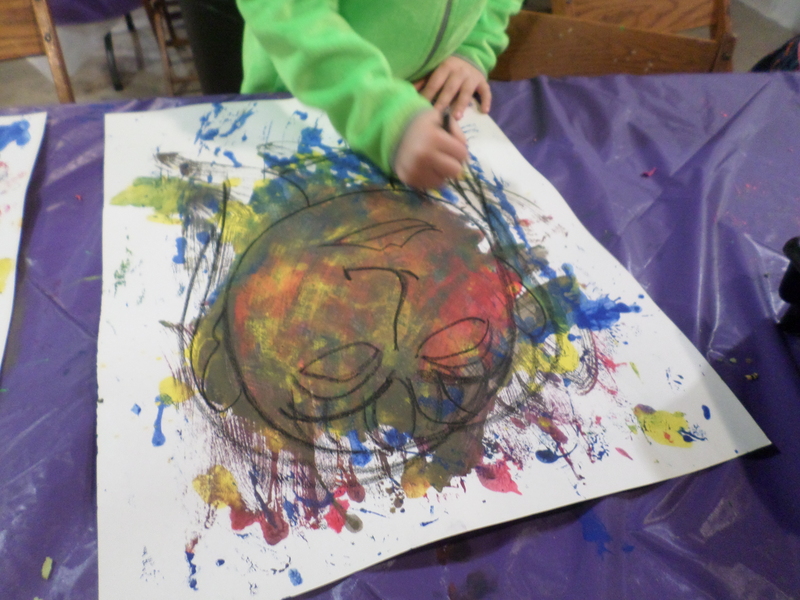 Next we turned the images into figures as each student created a portrait. 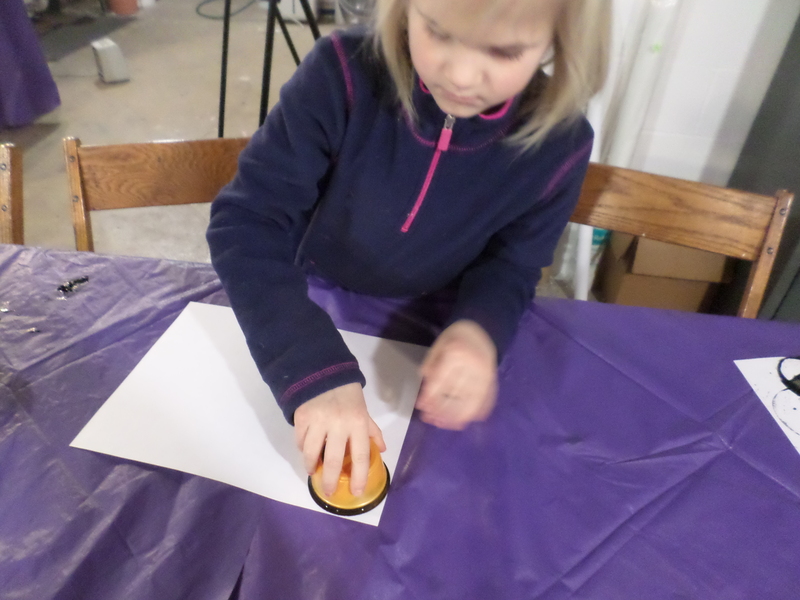 Everyone enjoyed exploring the new medium of melted crayon. 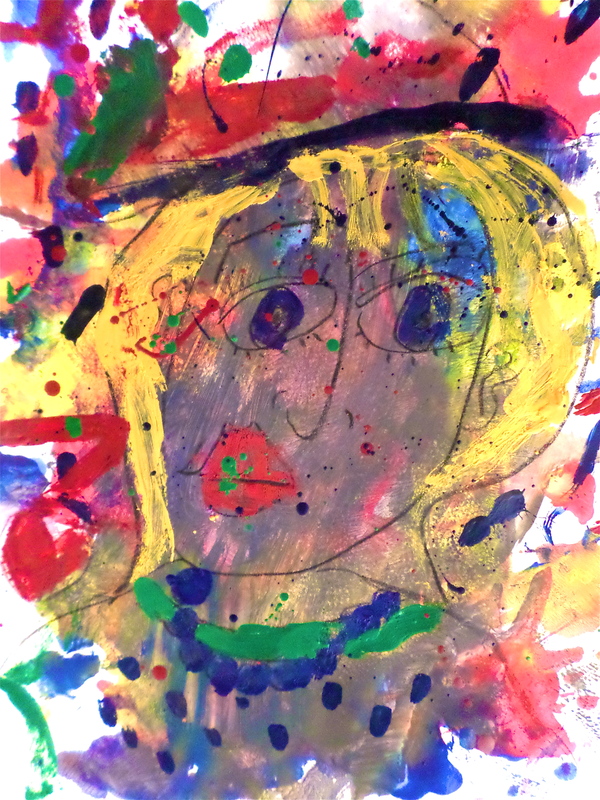 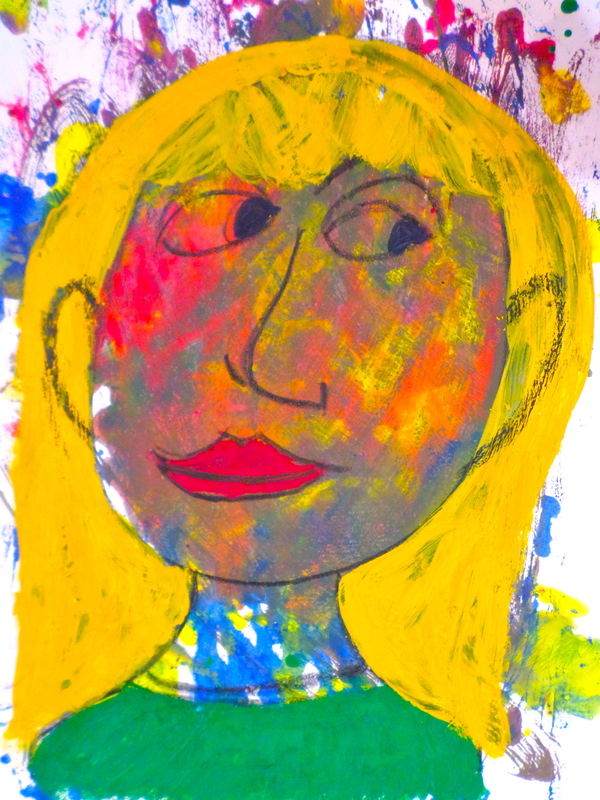 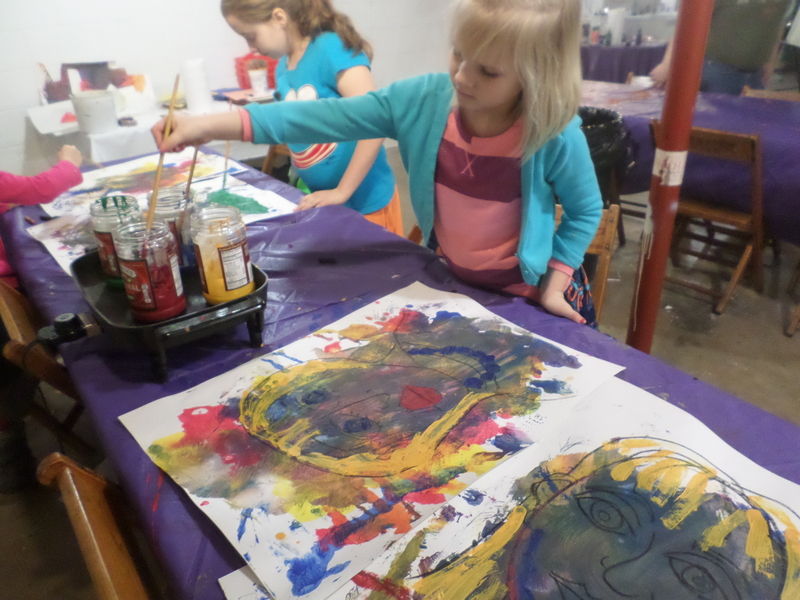 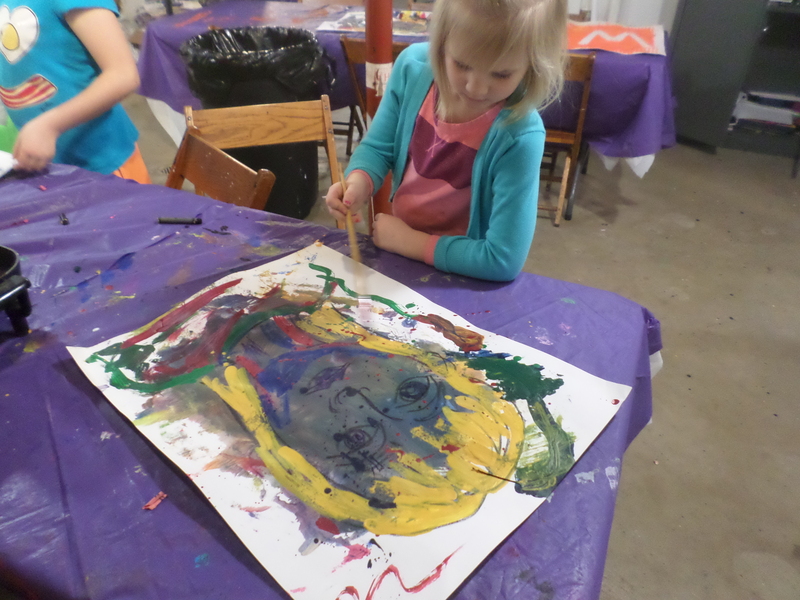 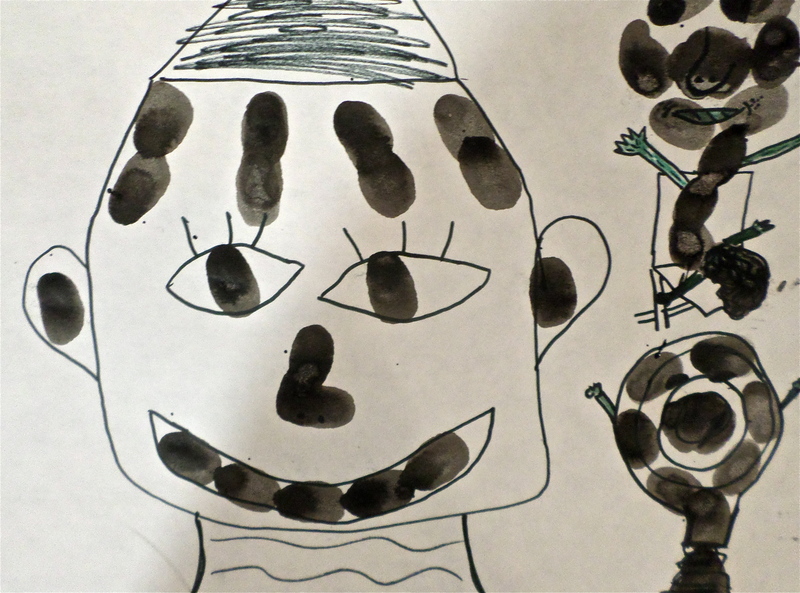 Everyone explored this new medium as they created a portrait with exciting possibilities. 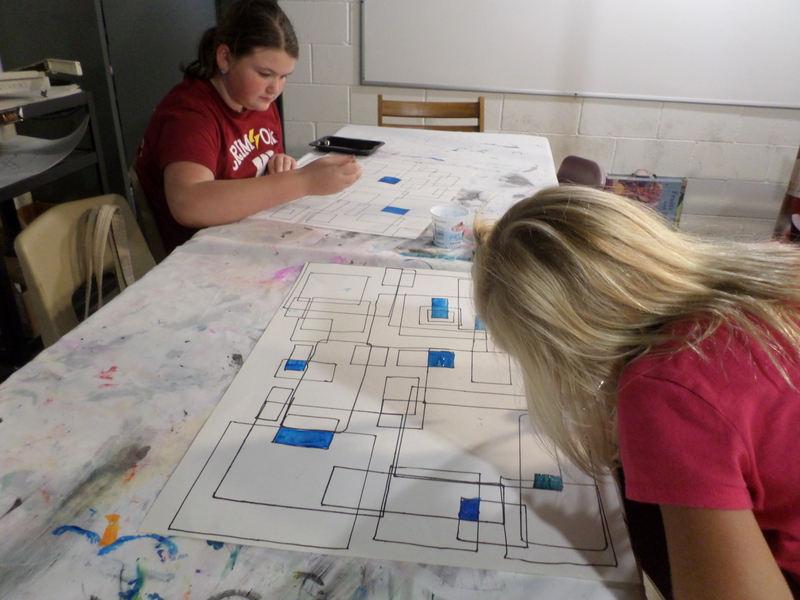 It was fun to watch each student’s process of creating.